In case you’re like me, I thought that I would share my top 5 tips on how to brighten a room, or ANY space! Even if you are working with a room that has zero natural light, there are still things you can do to brighten things up. To see my favorite ways to lighten and brighten, keep reading! This might be an obvious one, but the #1 thing you can do to lighten up an area of your home is let the natural light in! I like to decorate with light colored curtains because I love the way the light pours through them creating a soft glow. 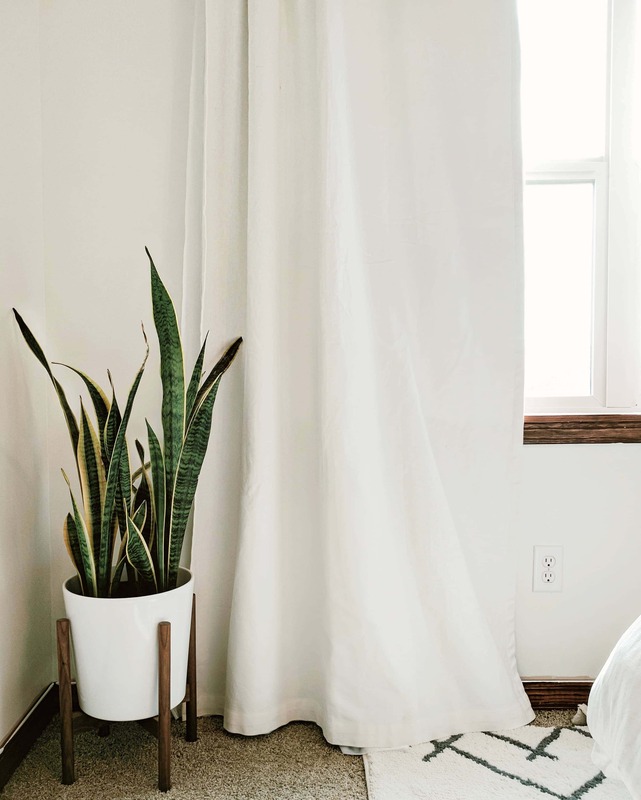 My favorite curtains for general living spaces are the simple white cotton ones from Ikea, but these ones from Amazon are very similar in case you are not near an Ikea. Really, any white cotton curtain will give you this same effect. You could even go with a light grey or beige color – anything that is light and neutral that will let the light through. In the bedrooms I like to use a blackout style curtain to help keep light out when we are trying to sleep. I know what you’re thinking, keeping light out is the exact opposite of what I just said. 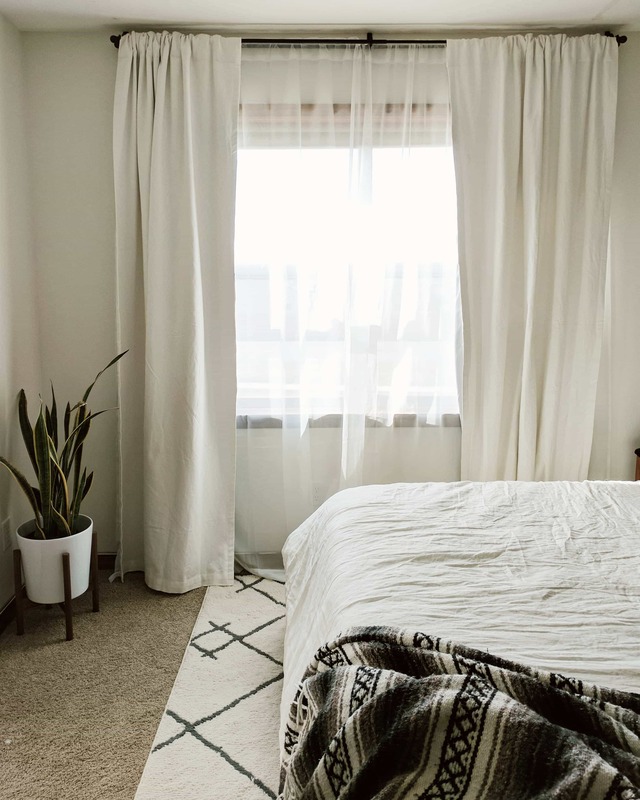 But here’s what I do to keep it light and airy feeling – layer the thick heavy blackout curtains (still in a white or light color) with a sheer curtain behind them. That way during the day when the blackout curtain is drawn back, the light will pour in through the sheers giving that same soft glow effect that I mentioned earlier. The blackout curtains shown here are no longer available but these ones from Amazon would work just as well. 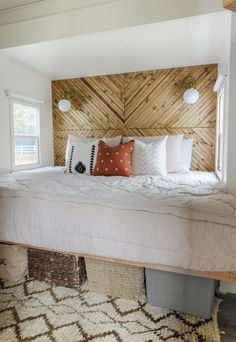 Paint is a fairly cheap and easy way to completely transform a room. 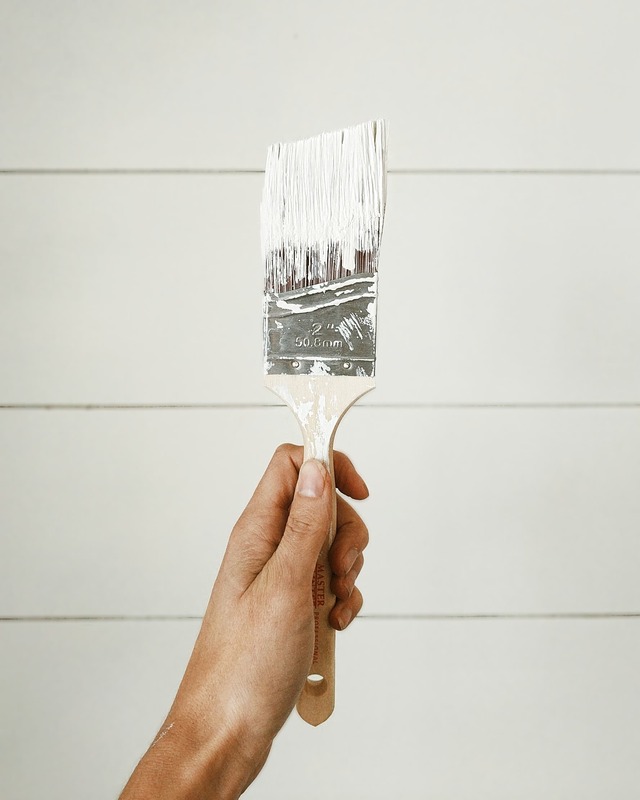 Painting your walls a white or off-white (really any light neutral color will do) automatically makes the room feel more open and bright, especially if you are working with a space that has little to no natural lighting. This is a fairly simple tip, but can make all the difference! 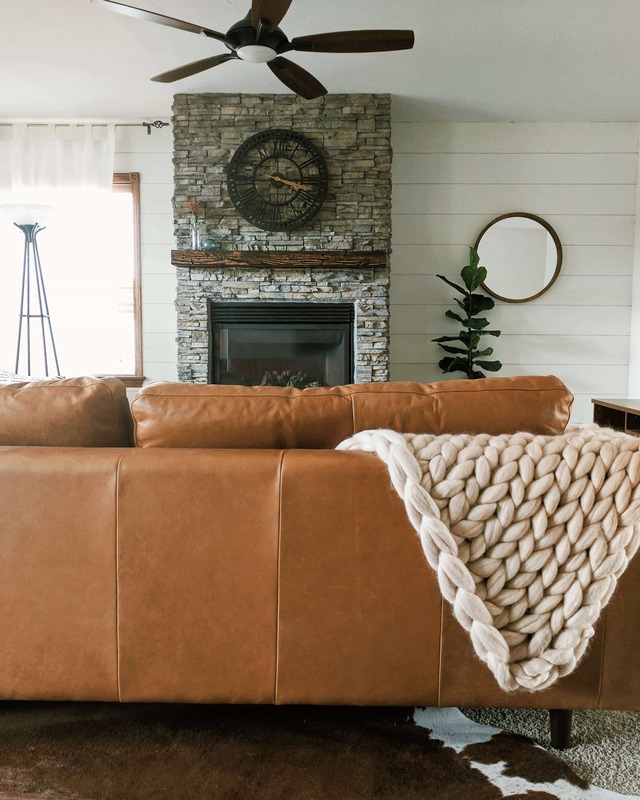 Rugs are a great way to not only add texture and interest to a room, but they can also create a light and bright overall feel. Like paint, light neutral colored rugs are a great way to brighten a space that has little natural light available. 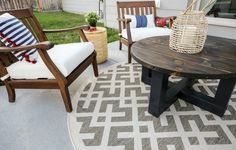 There are so many options for beautiful rugs out there and they are offered at all different price points. You can view some of my favorite picks here, here and here. 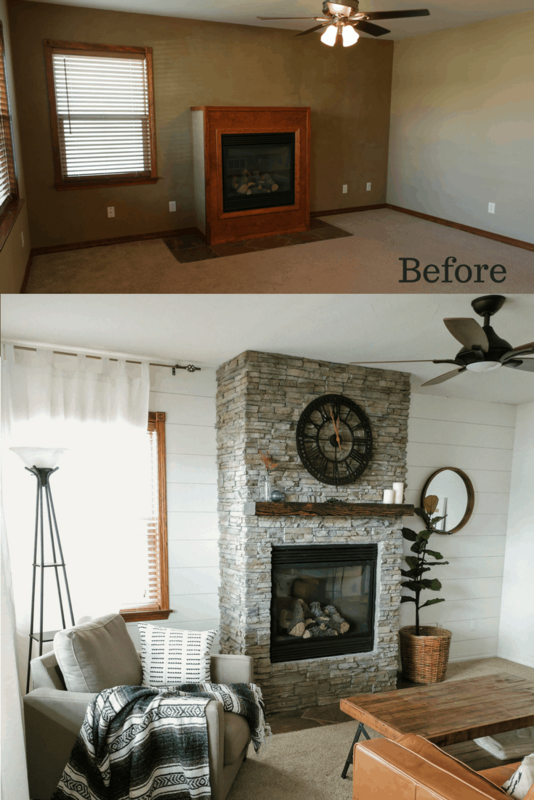 Below is an example of how I used a light colored rug to balance out the dark accent wall in our master. I LOVE decorating with mirrors. 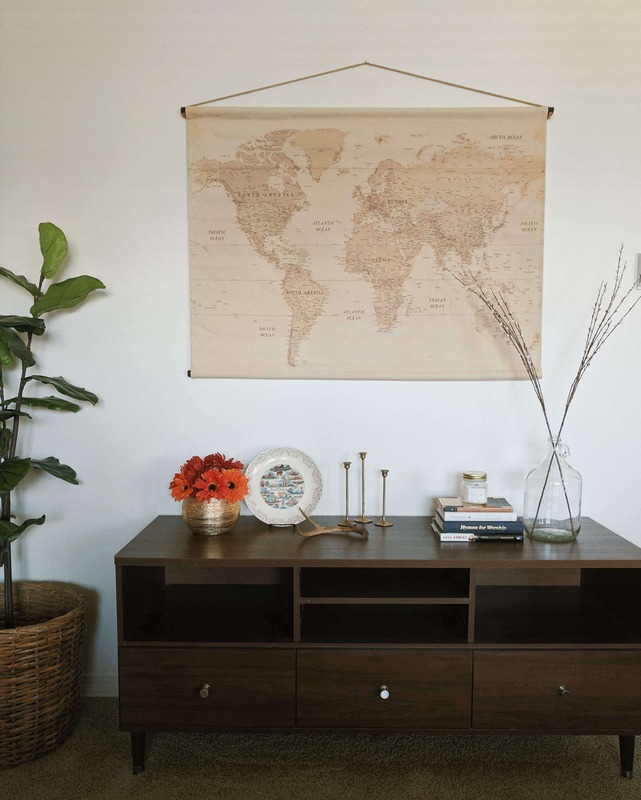 They make for easy decor pieces and are also great at opening up a small space and making the most of a room’s natural light. 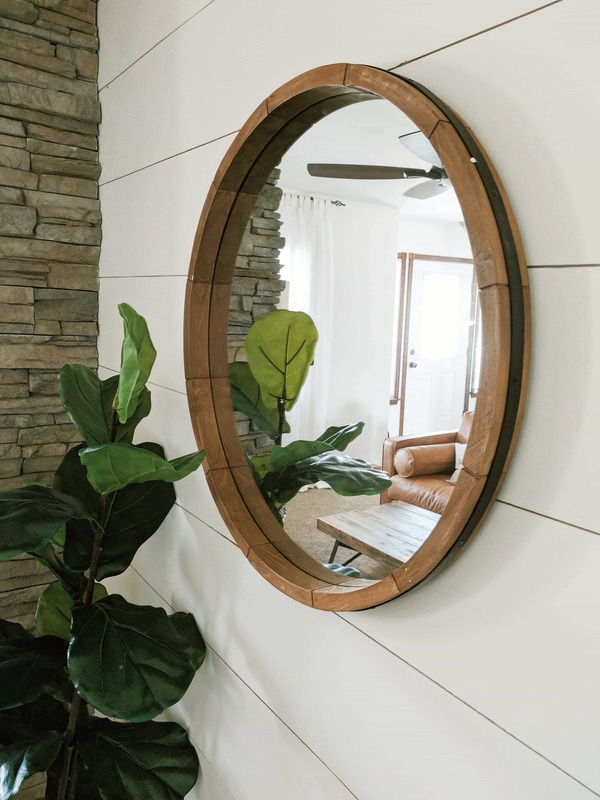 A well placed mirror can increase light and make the room feel brighter – try positioning it directly across from a window or on an adjacent wall. 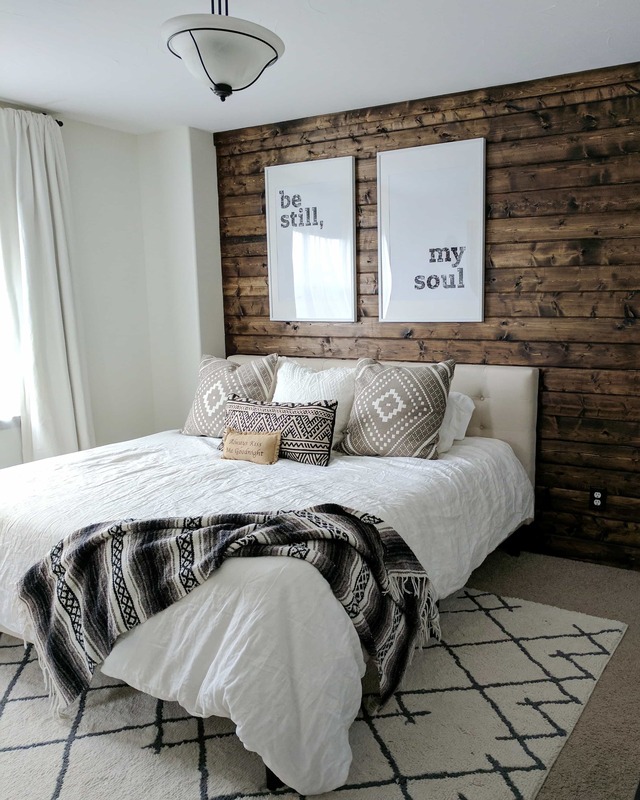 Plus, if you have followed any of the above tips, you can use a mirror to reflect the image of white walls, curtains and rugs which will add interest and brightness all at once. Below is one that I scored from the clearance rack at Target but I’m also loving these ones from Amazon (here, here, here and here). My last tip is my favorite one because, to me, it is the most fun! 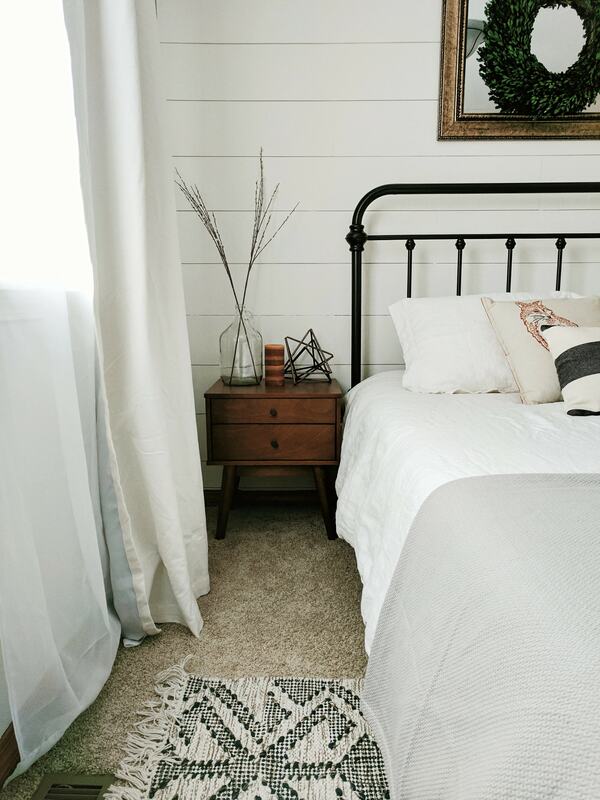 Adding neutral decor to a space will help to give it a bright and light feel. 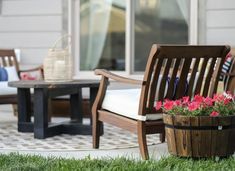 Try looking for classic pieces that will stand the test of time to make the most of your decor budget. Think outside the box and look for different textures to keep the space interesting. Clear glass and white porcelain are great timeless pieces. 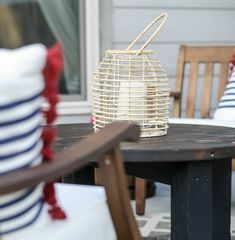 Ultimately, decorating is a way to express YOUR style so have some fun with it! 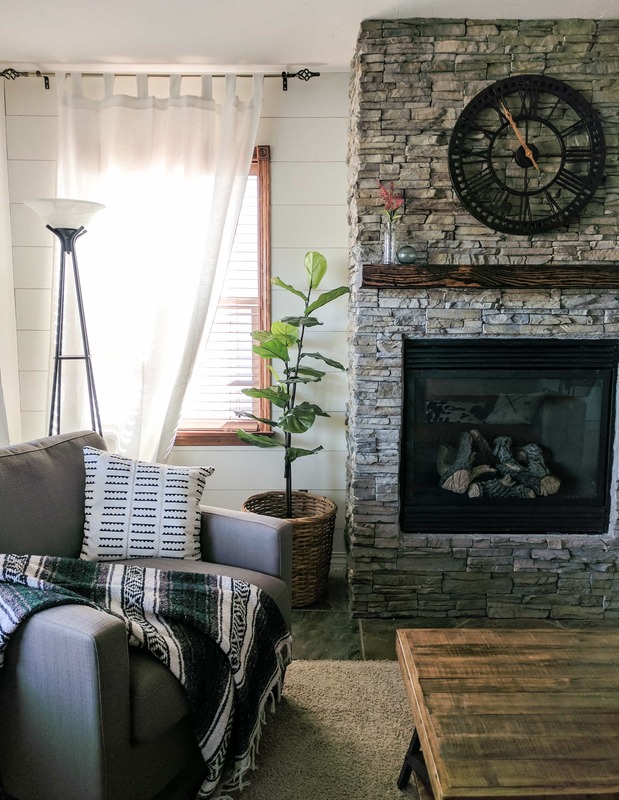 Below are a few examples of how I have used neutral decor in our home. That’s it! 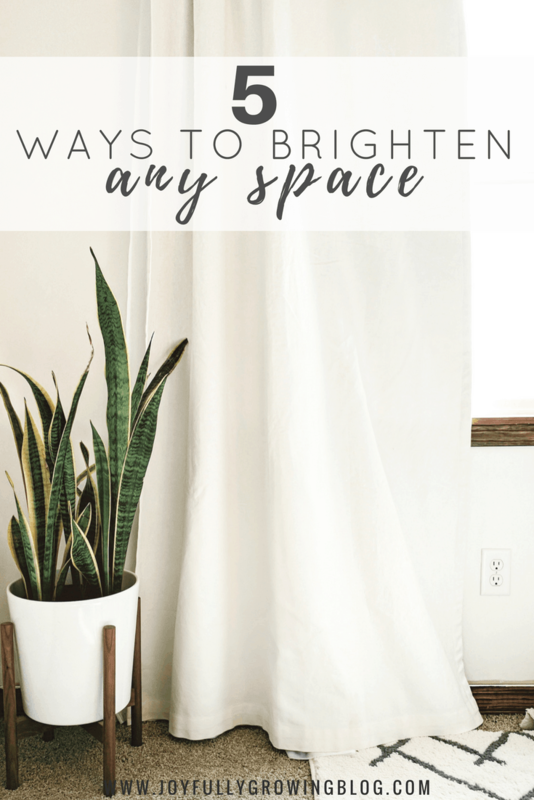 Those are my top 5 tips on how to brighten up ANY space. Looking for more home inspiration? You’ll love the post The Best White Paints for the Home (and how to choose the right one!). Where did you find those pretty white black out curtains? I am going to be updating the girls room next week (bunk beds arriving today!) and I was just thinking that I need black out curtains for better sleep during the summer. What a great post! 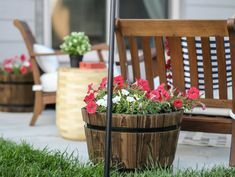 Loved all of the these tips and your house is beautiful. You are doing a wonderful job!!! I have that same round mirror from Target in my girls bathroom! !